A few weeks ago I was browsing the Internet, and came upon Viva Vegan, by Terry Hope Romero, co-author of Vegan Cookies Invade Your Cookie Jar, my cookie book of choice. I went to the bookstore the next weekend, looked at the recipes, and started drooling right there in the cookbook section. The book has hundreds of recipes of foods from around Latin America; stews and sauces, tamales, empanadas, deserts, and Sweet Corn Ice-Cream (a recipe I have been searching for since I first ate it in Southern Mexico in 2006!). Everything sounded SO GOOD. I bought the book and just read it for a few weeks before actually making anything. We were going to celebrate a coworker’s birthday at work one day, and someone else volunteered to make a tres leches cake (a yellow cake soaked in three different milks). 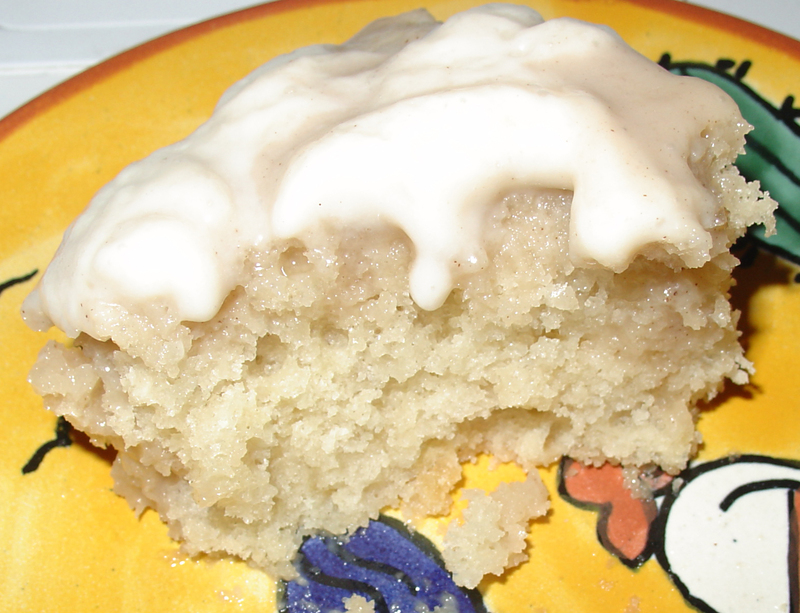 I immediately jumped up and decided that I would take that duty with the Viva Vegan Coconut Tres Leches Cake. 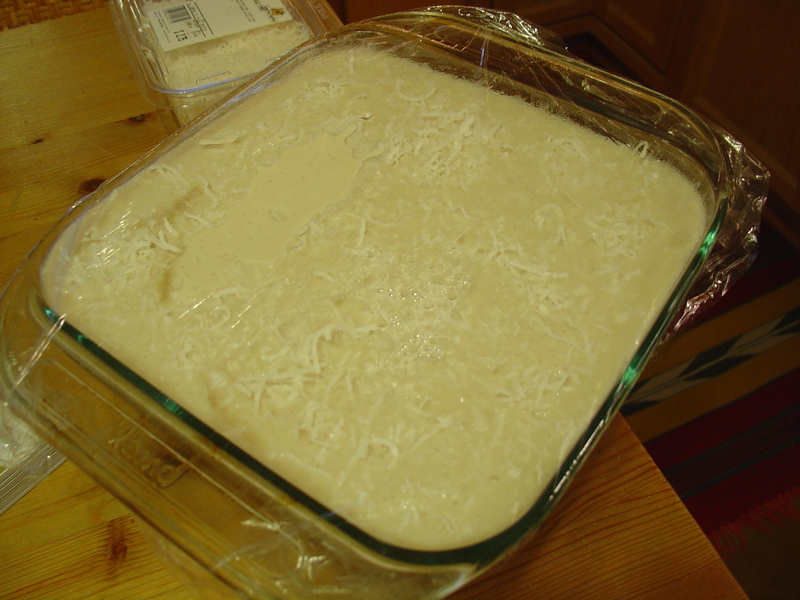 Traditionally, the cake is soaked in three different dairy milks (sweetened condensed milk, cream, and evaporated milk). For the vegan version you use almond milk, coconut milk, and coconut cream. At first, I was just proud of myself that my cake came out of the oven looking like a cake. I had not yet ever made a vegan cake, so that in and of itself was quite the success. Then, I started making the soaking liquid. It was surprisingly complicated, and resulted in my liquidy pot of milks and sugars boiling over into the burner. (Oops.) But, eventually the liquid had thickened and was ready to be poured onto the cake. One of the fun parts was poking the cake with lots and lots of holes so that the liquid would soak better. Maybe I’m just a violent person at heart, but I really liked attacking that cake with hundreds of tiny toothpick stabs. But, the hard part was yet to come – the frosting. This frosting marks my first experience with agar agar. (And the procurement was a whole obstacle itself. First I went to Whole Foods, balked at the price, and decided to go to my regular grocery store, as I had remembered seeing it there a few months ago. So, I went to the other store, looked around for a while, asked an employee who went to go check, and found out that they had stopped carrying agar agar. Then I had to go back to Whole Foods again, and buy the expensive agar flakes. But, I guess the package will last me a really long time, so it’s not too bad.) Agar helps to gelatinize foods, without regular gelatin. Like gelatin, you dissolve it in hot water, and then add the sugar and flavoring. I did this and poured it onto the cake to let the frosting gel. The recipe said to sprinkle coconut flakes on the top, which I did. Coconut Tres Leches Cake, Under Plastic Wrap. Above is the somewhat unimpressive top of the cake. It pretty much just looks like white pudding. But here is the delicious detail. It was really very good, but very sweet. I ended up taking a lot back home with me, and couldn’t eat it fast enough. With all the milks and sugars, it went bad quickly, even in the refrigerator. 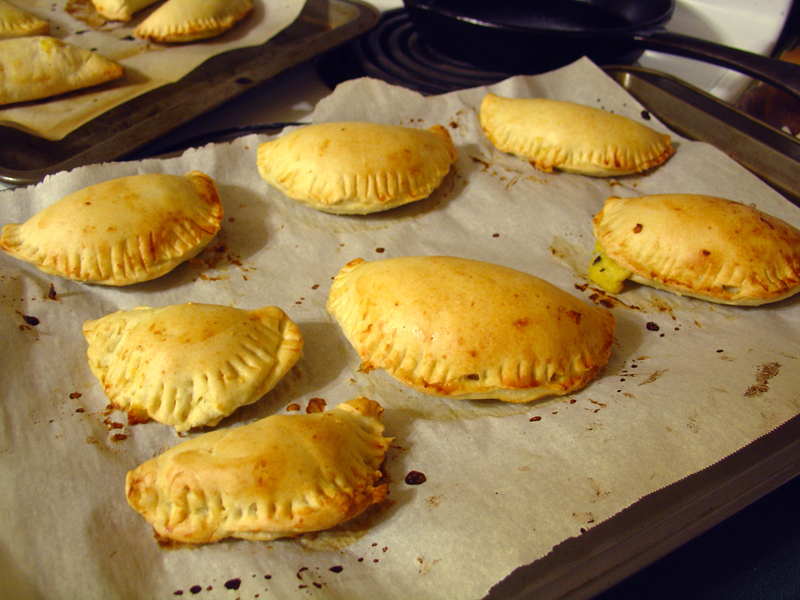 Next, I decided to make empanadas. Empanadas!! 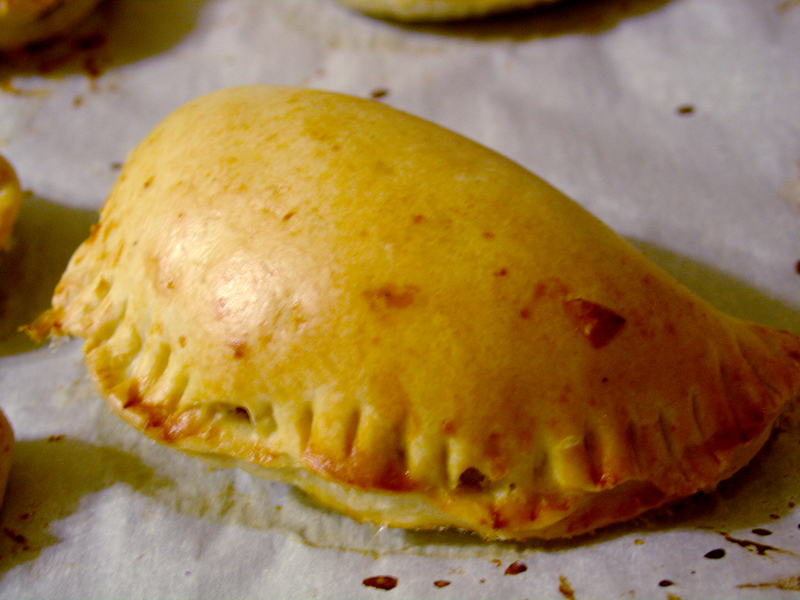 Viva Vegan has several different recipes for empanadas, but I chose the one that looked the simplest: Empanadas Humitas (corn-filled empanadas). It is fairly preparation-intensive, but I just considered it a practice session for when I get around to making tamales. You have to make the dough, and then let it chill in the refrigerator for at least four hours. Then you carefully roll the dough, and cut out six-inch circles (I think mine ended up being five inches. I just used a round tupperware dish with sort of sharp edges as a cutting tool). Then you have to put it back in the fridge for a bit longer. While you do that, you make the filling. The corn filling is actually little more than corn, soy milk, and spices. I was worried that they wouldn’t work for some reason, but they came out wonderfully. Trays of Empanadas Humitas (Corn Empanadas). Close-up of a delicious empanada humita. I didn’t know that soy milk can work as a “crisper”. That is, you can put it on top of baked goods as a glaze and it will make hem brown and crisp a bit on top. I can’t wait to make more empanadas. I used to love going to one of the panaderías (Mexican bakery, literally, bread store) near my work and buy sweet piña (pinapple), crema (sweet cream), or manzana (apple) filled empanadas. Viva Vegan doesn’t have recipes for those fillings, but I’m going to look around and try to figure out how to make some sweet empanada fillings. Yum, yum, yum!